By using visioplasticity method the velocity field can be determined experimentally, and then the stresses can he obtained analytically from these experimental measurements. That means, strain rates and strains are calculated directly from the velocity field while the stress distribution is calculated from an analytical solution of the equilibrium equations and the constitutive equation relating the stress and strain for the material. This method can also provide detailed data of the pressure distribution on the die surface, which is important in the design of the die profile. In the paper cold forward extrusion through a conical die is illustrated by extruding copper alloy specimens with inscribed grid lines. Stress state distribution in plastic deformation region was analyzed using the visioplasticity method. From the flow lines of each element, the velocity and the strain rates are obtained. Finally, the stress components are calculated from the equilibrium and plasticity equations. The natural frequencies and mode shapes of an Euler-Bernoulli beam with a rectangular cross- section, which has a surface crack, is investigated. The crack is modeled as a change (sudden or gradual) in the cross-section of the beam, and the perturbation approach is used assuming that the crack is much smaller than the beam cross section. Computations of natural frequencies and mode shapes were carried out for four different crack shapes with rectangular, triangular and parabolic profiles when viewed through the side of the beam. The results are listed in non-dimensional form for various values of the parameters characterizing the crack. А relatively inexpensive instrument (for fog density control), which works in the visible specter, is presented. Its purpose will be to alert the occurrence of fog or visible pollution in the air. It can also detect, if the cleaning fog has reached all areas. This equipment can be used to assess the density of fog. The device is designed for continuous monitoring of the atmospheric air and detection of dispersed agents in the form of aerosols. The total concentration of aerosols is measured and if it exceeds the pre-set threshold, an indication is given via a LED and the information can be exported to external systems. The principle of operation of the device is based on the spectrophotometric method. A beam of monochromatic light is passed through the investigated environment and its intensity is attenuated by the presence of pollutants. The hardware of the device is described, as well as its construction, software and the measuring procedure. Many theoretical concepts of studying innovation strategies concentrate on selected aspects and determinants of this phenomenon and dissemble cohesive and wider perspective. In result there is lack of comprehensive researches concerning innovation policies, especially covering long term, repetitive studies based on the same methodology. 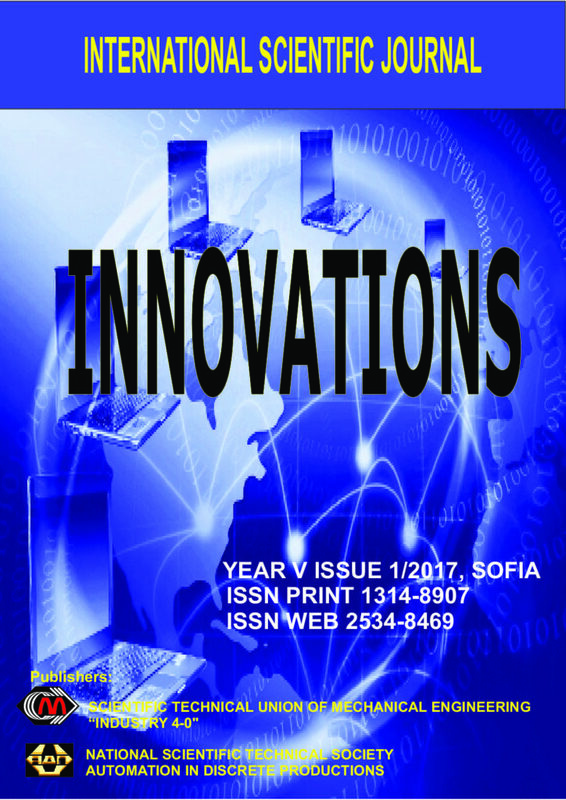 The main purpose of this article is to assess innovation strategies applied in Polish medium and large industrial enterprises based on three dimensional innovation activity model – innovation cube. Those dimensions are: place of creating, continuity of activity and way of innovation utilization. In result of imposition above criteria these model presents eight different variations of innovation policies. The most common innovation policy utilized in Polish industrial enterprises is individual innovator. This means that innovations were created in continuous manner, based on own resources and for own use. The test sample covered years 2007-2009 and 2012-2014. Surveys were conducted on group of medium and large Polish enterprises belonging to low-, medium- and high-tech industries. Each phase of research was based on the same methodology. From first stage 80 responses were obtained and from the second one 92. The main issues are considered in this article: urgency creative learning in the system for retraining and improving of pedagogical staffs’ professional skills in the Republic of Uzbekistan, specificity of ICT-professor’s activities, pedagogical conditions and content of ICT-professors’ creative learning, pedagogical model and stages of organization classroom for ICT-professors’ creative learning.